Fujikawa Harmony ... keeps UV rays at bay. Sedar, a home décor company in the GCC known for its high-end window fashion/wall paper products, has launched new products ranging from wall paper to fabrics. The products are in line with the company’s recent rebranding as the products boast modern elements and design. Its latest wooden roller blinds are handmade from natural wood, bamboo, and woven textiles. Available in a variety of colours and finishes, the blinds can be customised with a choice of blackout fabric backing and fabric trims to create the exact look required. The blinds are also available in customised widths and heights, providing the utmost convenience and adaptability for any space, according to a spokesman for the company. 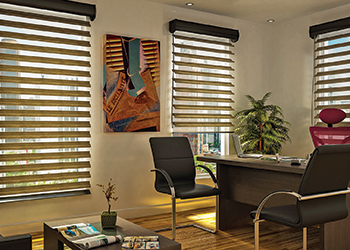 Sedar has also launched aluminium venetian blinds. Adjusted by a thin, yet heavy-duty cord and a durable tilted wand, these venetian blinds provide high flexibility in controlling the levels of horizontal light. With slats that rotate up to 90 degrees in either direction, the amount of light allowed in can be carefully optimised or – when closed tightly – virtually eliminated. To maximise light, the slats can be drawn up vertically – an operation that can even be motorised for effortless convenience, he points out. The company has also introduced York weave roller blind. “Available in a choice of light-reducing fabrics, the blackout sunscreen absorbs incoming light, while a silver sunscreen option takes the effect one step further by reflecting light, and therefore heat. Also new is Fujikawa Harmony, a simple system designed to give the look of a regular roller blind, but offering an edge in reducing the harmful effects of ultraviolet (UV) rays, without compromising on privacy. “Fujikawa Harmony combines the features of light control of a blind, the function of a shade, and the softness of a curtain. The soft, adjustable fabric vanes are suspended between sheer fabric facings, allowing the consumer to control the amount of light entering the room. Ethan Allen UAE, a premier interior design company in the UAE, offers a host of mirrors that can help illuminate dark corners, add elegance to an area and create the illusion of more space. “Mirrors provide an easy way to enlarge spaces as they help reflect and increase interest in certain areas of home,” says George Foster-Vincent, head designer in the UAE for Ethan Allen. Foster-Vincent continues: “It is important to know where and how to place them. Today, mirrors in a home can be considered an art. When I’m designing a space, I use mirrors to enhance architectural detail (such as in the ceiling-to-floor concept); on a large wall; I normally introduce a collage of sunburst mirrors to create a dramatic impression. 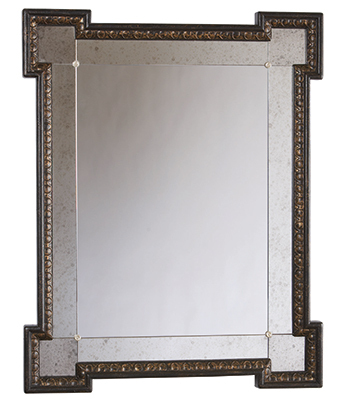 I also like to place mirrors above entrance halls, console tables and dining rooms. The Paiova 5 bathtub ... masculine. Modern bathrooms are currently leaning towards masculine design with authentic materials and a manly character, according to Duravit. This style is defined by linear forms and sharp edges with a clear structure, says the Germany-based company. 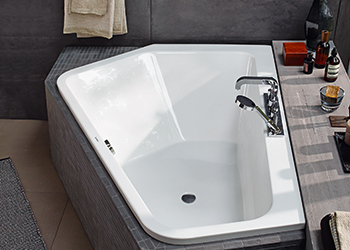 To cater to this trend, Duravit offers Stonetto, a shower bath, and the Paiova 5 bathtub, both created by the Austrian design trio Eoos, and the ME by Starck by Duravit and Philippe Starck. A man’s bathroom is minimalistic - masculine and pragmatic, with a slightly casual feel. “It is characterised by functionality without frills and framed by simple design and muted colours. While women generally prefer soft tones, men often choose light grey or regal black,” says a spokesperson for Duravit. “Stonetto gives the appearance of a matte, stone-like structure. The shower bath feels similar to a stone eroded by water,” the spokesman says. The Duravit bathtub Paiova 5 by Eoos with its sculptural design, responds to this need while providing enough space for two people. A comfortable ambience is created by combining characteristic elements such as a leather armchair, the spokesman adds.